The Italy City Council will have their regular monthly meeting today, Monday, April 9, 2012 in the Council Chambers of the Italy Municipal Building (105 West Main Street, Italy). Meeting time is 6:30. Among other items, the agenda slates an updated animal regulation ordinance will be discussed. The meeting is open to the public. Discuss and consider necessary action(s) regarding the approval of an Interlocal Agreement with the Italy Independent School District for landscape maintenance of the George Scott Park. Discuss and consider necessary action(s) regarding lease agreement with Internet America. 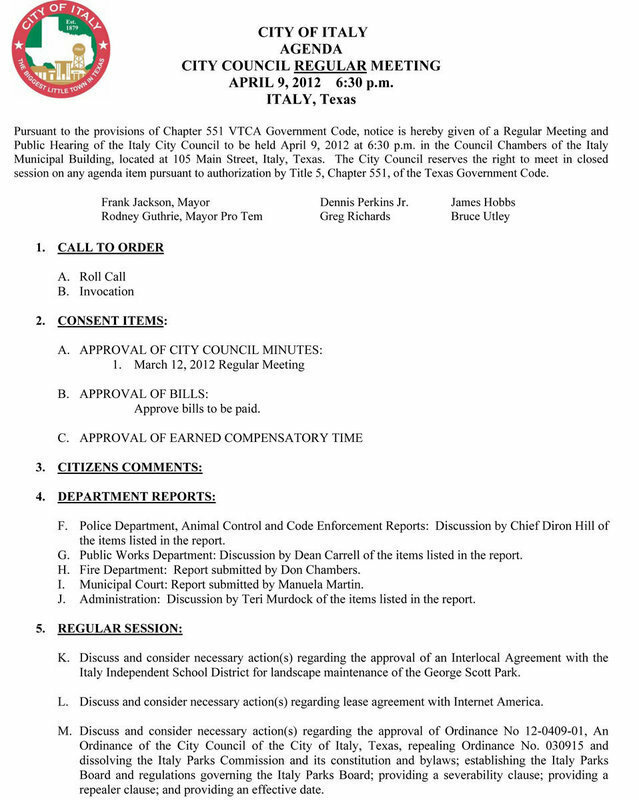 Discuss and consider necessary action(s) regarding the approval of Ordinance No 12-0409-01, An Ordinance of the City Council of the City of Italy, Texas, repealing Ordinance No. 030915 and dissolving the Italy Parks Commission and its constitution and bylaws; establishing the Italy Parks Board and regulations governing the Italy Parks Board; providing a severability clause; providing a repealer clause; and providing an effective date. Discuss and consider necessary action(s) regarding the approval of Ordinance No. 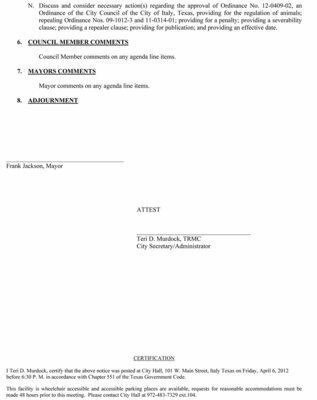 12-0409-02, an Ordinance of the City Council of the City of Italy, Texas, providing for the regulation of animals; repealing Ordinance Nos. 09-1012-3 and 11-0314-01; providing for a penalty; providing a severability clause; providing a repealer clause; providing for publication; and providing an effective date.